The Milwaukee Regional Center was established in 2007, when it was approved by the Department of Homeland Security to sponsor investment projects in southeast Wisconsin. Created to stimulate investment in the U.S. economy and to create new jobs for U.S. workers, the federal EB-5 regional center program has grown rapidly in the last several years. The program offers foreign investors and their families the opportunity to apply for green cards in exchange for qualified investment in qualified local projects. Investors must be approved by the U.S. Citizenship and Immigration Services (“USCIS”) in order to obtain conditional green cards and permanent green cards. To qualify for a green card, a qualified foreign investor must invest a minimum of US $1 million (or US$500,000 in targeted employment areas) in qualified businesses that create at least ten full-time permanent jobs for U.S. workers. Provided that the investment is maintained and achieves the job requirements of the program, a foreign investor may apply for a permanent green card two years after he or she obtains a conditional green card. The Milwaukee Regional Center includes the Wisconsin counties of Kenosha, Milwaukee, Ozaukee, Racine, Walworth, Washington and Waukesha. 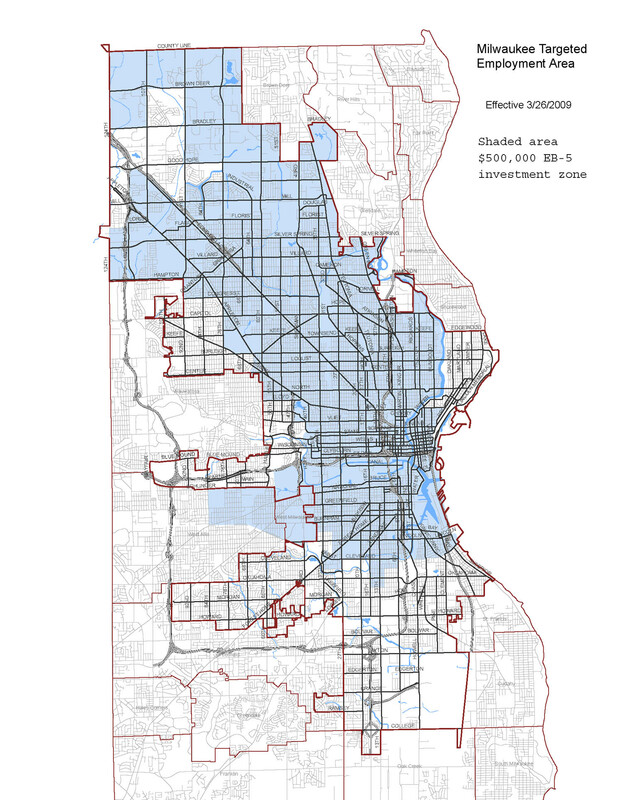 Targeted employment areas within the Regional Center area that qualify for the $500,000 investment level include designated areas of the City of Milwaukee (see map), all of Walworth County and the City of Racine. In 2017, the Milwaukee Regional Center expanded beyond Wisconsin to include the Illinois counties of Cook, DuPage, Lake and Will, as well as Indiana's Lake County. For more information about the EB-5 Regional Center program, please visit the USCIS website, or contact Craig Kammholz, (414) 287-4163 regarding the Milwaukee Regional Center. The Milwaukee Regional Center is administered by the Metropolitan Milwaukee Association of Commerce Regional Center, LLC (“MMAC-LLC”). While MMAC-LLC and its affiliates (collectively, "MMACRC") generally welcome investment in the Milwaukee Regional Center area, MMACRC does not have sufficient information about the investment opportunities identified below to be able to recommend, nor does it endorse, any particular investment opportunity. MMACRC is not, by listing and providing basic information about each investment opportunity, promoting any of the investment opportunities listed. Investment offerings are not open to U.S. investors; the descriptions of the investment opportunities are neither an offer to sell nor a solicitation of an offer to purchase any securities. Building on Milwaukee’s proud beer brewing heritage, two historic buildings at the former Pabst brewery site in downtown Milwaukee have been converted to a 90-room extended-stay hotel, the Brewhouse Inn & Suites. The six-floor boutique hotel maintains many of the brewery's original features, including spiral stairwells, arched stone doorways in the lobby and the iconic brew kettles. This fund invests in properties that qualify for EB-5 status. Each property is reviewed for its ability to generate the necessary direct and indirect jobs. Once this requirement has been established, the Fund analyzes the potential return on investment (ROI) and security of the overall project. >See more project success stories. The following banks are generally available to provide banking services. Other major international banks may also be used.